First, let’s start with the top coat. 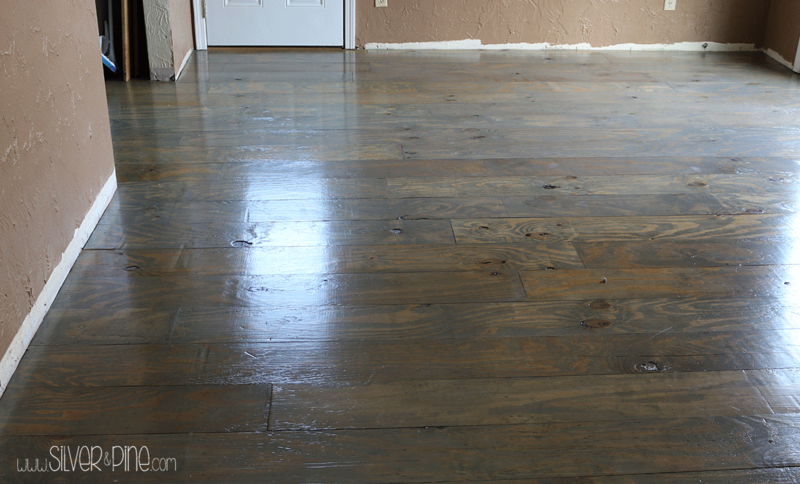 As I was finishing up the family room floor, I realized that I never shared how easy it was to apply the top coat, and now would be a good time to show you. This is what we used, Varathane Floor Finish in Semi-gloss, and you can get it thru Home Depot. 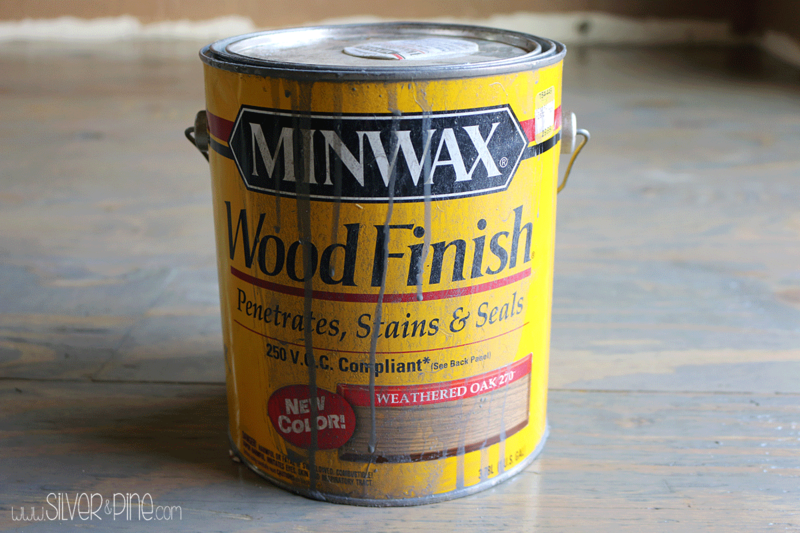 We also used this on the ash flooring we have throughout our great room. You are going to want to purchase an applicator pad, which I realized that in this photo, the packaging isn’t in English, opps! anyway, I used a 3/4″ nap pad that attaches to the base of this pole. Don’t forget to tape off anything you want to protect. We haven’t put the trim up or painted the walls, so the only thing I had to worry about was the door to the attic. This stuff drys like clear plastic, you don’t want to have to try to paint over it later. I started at the furthest corner and just brushed it on. I only covered about two rows at a time so I wouldn’t loose track of where I left off….because it drys clear..
As you go along, the top coat will gather in the seams and knots, so just make sure to double check and smooth it out with the corner of your applicator pad. Easy fix. I would also like to mention that when I started the second coat, I began in the opposite corner than on the first coat. Because of the texture of the planks and the knots in the boards I wanted to make sure to get the top coat in all the nooks and crannies, but I have been known to be slightly particular, so do what you feel is necessary. When applying the top coat, try to think more like you are using a squeegee and less like you are using a mop. Go along with grain and in the same direction that the planks have been installed. I also did this in my bare feet, you will step in it I promise, and I wanted to make sure to not leave a bunch of lint all over the floor, again, I am particular. If you remember, I had to tape off certain areas because I couldn’t get all of the flooring done at the same time. If this the case for you, be sure to take into account the thickness of your applicator to make sure you are not getting top coat on the already finished floor. Just add more tape if need be. I pulled up the tape before I applied the final coat because I wanted to make sure to seal the seams that might have been exposed due to being covered by the painter’s tape. Can you tell where the tape used to be? OK, so what you see here is a little bit of white paint that seeped under the tape that we put down earlier. Before applying the fourth coat of your clear coat, make a point to fix these. I found that a number two pencil is the perfect shade of gray to blend right in with the rest of the board. Cool right? Here is a small sliver of exposed plywood in the girls room. This is also an easy touch up with a pencil, then just go over it with a light coat of clear. The girl’s room has a few places where this has happened, which is why I encourage to sand and pick at any loose pieces of wood that are on your planks. The girl’s room was the first room I sanded, and I wasn’t very aggressive because I just didn’t know any better. While moving furniture around in their room, the loose piece just caught and came off. But you can fix it in about 3 minutes, or just do a better job sanding than I did. It has been about 3 months now since the kids have been in their rooms and using their new bathroom, and so far no issues at all. It is holding up well in the boys room, and that is saying a lot if you know anything about little boys. The color of the floors is a perfect compliment to all of the other colors going on in the girl’s room, which I will share in another post. My daughter Lea was the first child to puke on the new floors, and even though it was gross, the floor wiped up just fine! I hope this is enough to encourage you to not be afraid to try this in your own home. After talking about plywood floors with my neighbor, who was just pricing out hardwood flooring, they have decided to go the plywood route too. 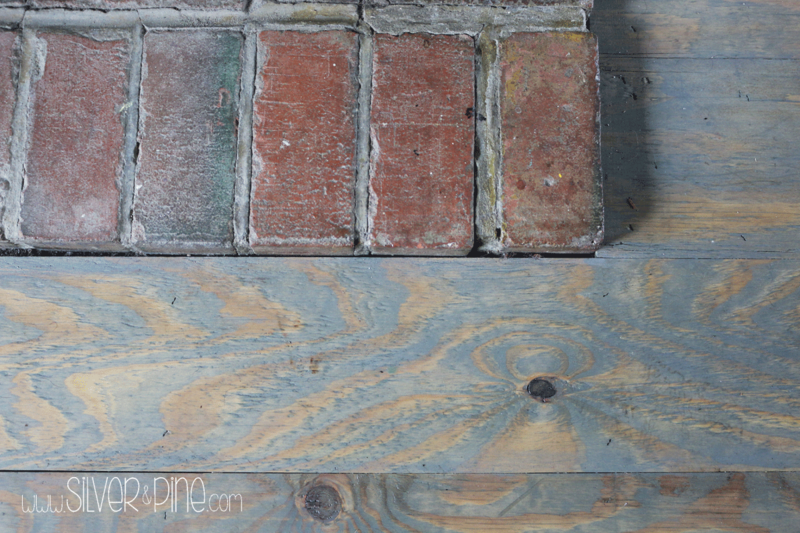 They are using 6″ planks instead of 8″ and are going to stain instead of paint. So exciting!! I can’t wait to share with you the results, with their permission of course. Over the past few weeks I have painted 4 dressers, two mirrors, made over some thrifted art, and done a TON of thrift shopping for the kids rooms and family room. We just ordered some custom black metal pieces similar to what we used for our stairs to use as shelving in the family room, and I think I am going to chalkboard paint one of the walls upstairs. I can’t wait to share everything with you over the next few weeks. Until then! *UPDATE* I have received a few emails in regards to how our plywood floors are holding up since we installed them in March, 2016. They are just fantastic! We have had no issues in the bathroom where the our four children use on a daily basis. I wanted to also share another take on our floors, our neighbor installed plywood flooring also, following our instructions, and decided to use stain instead of paint. I took some pictures so you could see for yourself. 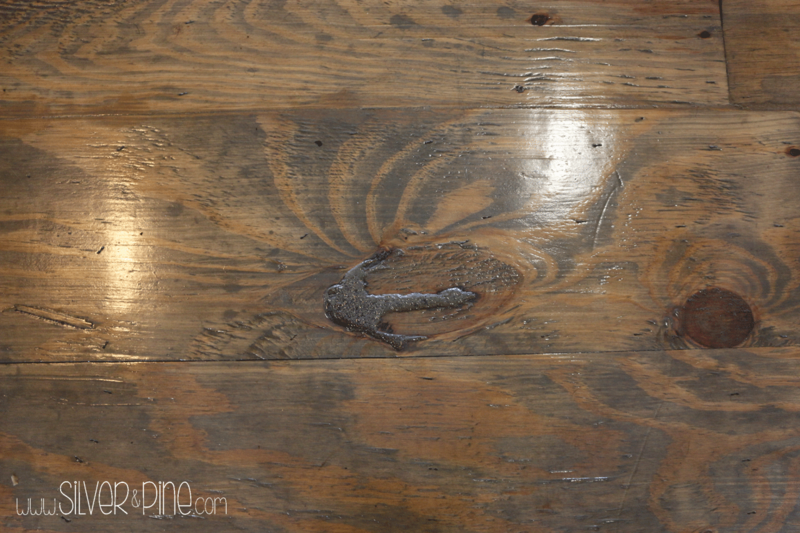 This is the stain they chose, Weathered Oak. They installed the plywood planks throughout the first floor of their home, including the kitchen. They used the same top coat also. Looks great right? They have a brick hearth for their wood-burning stove and the color of the floor is just the perfect compliment to the color of the brick. I love how this project is so versatile! I would love to hear from anyone who has installed plywood flooring in their homes, feel free to email me a pic and let me know how you like them. I am just wondering how they are still holding up. We just did our boys room with plywood but I am considering an entryway. Do you think it will hold up to the abuse? You are very welcome Doreen! I am glad they are helpful. I am starting this project on Saturday and am so happy I stumbled across your post. All your details are going to be so helpful…I am excited to see how they turn out, yours are beautiful! Thanks! How exciting! I hope you love them as much as we do! Good luck with your install! Hi! Beautiful. We are trying this this summer. My only hesitation is the spaces between planks. Are they filling with dirt? Hi Jessica! We decided to install our planks right up against each other, no spaces. I was worried about dirt collecting in them and I also wanted to avoid the floor looking like farmhouse style plank flooring. We have had no issues, plywood doesn’t expand and contract like typical hardwood flooring, so it really isn’t necessary. I hope this helps, thanks for taking the time to leave a comment. Good luck with your project! How do these floors do when moping? Do they shine as hardwoods do? I use a swiffer wet jet on these floors. The shine is from the top coat, I used 4 coats, you can use up to 5. I haven’t used anything else yet, but will be sure to update when I do. Thanks! Do they scratch easy? We have 4 kids 2 dogs 4 cats. Im worried the poly will scratch? So far the poly is holding up just fine. I applied four coats, I have four kids also. The only places I have had any issues is where the edges of the planks are. In a few places, I didn’t sand as well, so there was a few splinters when I was moving furniture around, but it was an easy touchup. I don’t have pets yet, so I can’t speak on that yet. Thanks! The floors are fabulous! I am wanting to do this in a home we will build, and your instructions are so informative and help give me the basis I need to make a decision about using plywood. I have had my concerns about water and bulging flooring. We had a water line leak from the ice-maker, and the entire kitchen floor was a mess. Hi Mardi! I had my concerns also as far as water and plywood also. That is why we used silicone in the bathroom. As of right now, we have had no issues at all, a few scratches where the kids play, but it is an easy touch up. I haven’t had a toilet overflow or any major water catastrophes yet, I will be sure to update if or when that happens. Best of Luck! I am in love with these floors! We are getting ready for a floor remodel and I have husband on board with plywood floors but my concern is the area we are starting is a high traffic area. We have a large landing at the top of our stairs and it’s our access to our bedrooms and bathrooms…. plus we have three puppies. I am concerned with the dry time of the polyurethane. What would you think would be the pros and cons if I would paint and poly my boards before I laid them down? Hi Melissa!! The only thing I would think might be an issue with applying the clear coat before install is how to deal with the spaces in between each plank. The clear coat will work its way into the gaps if you apply it afterwards, so if I was in your situation, I would try to apply it after it was completely installed. The clear coat that we used dried within an hour, and I was able to do all the coats in one day. We have had a few scratches, but it was an easy touchup.. I hope this helps, best of luck! !